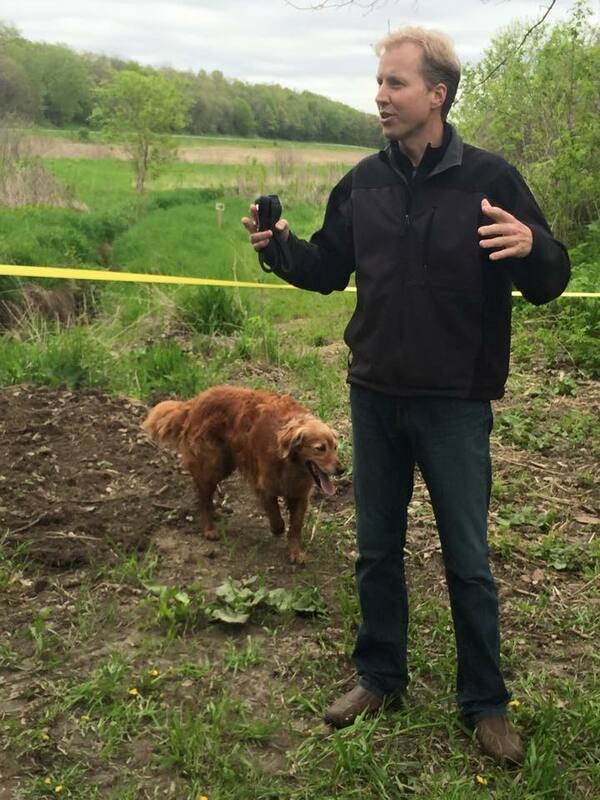 A portion of the Norwegain Ridge Birding and Nature Trail honored Joseph Langland, by renaming part of the trail the Joseph Langland Literary Trail. The sign was unveiled during Syttende Mai 2016. 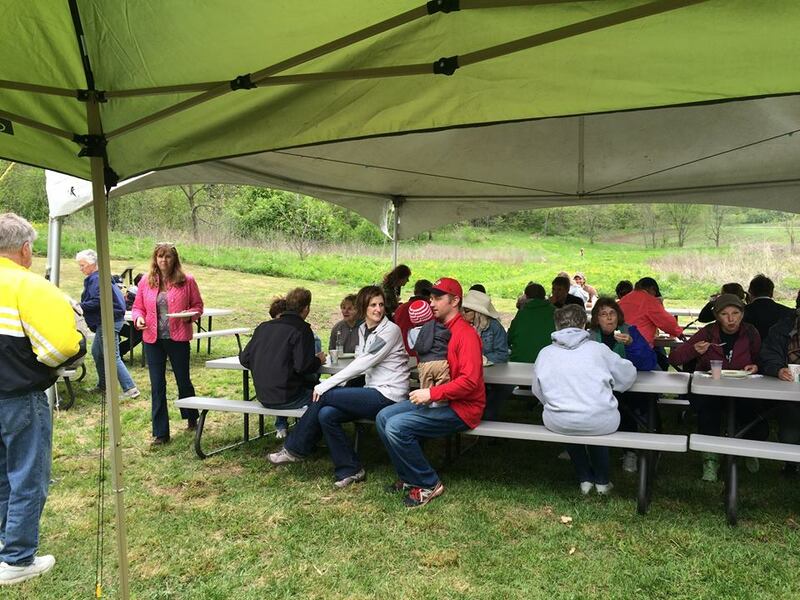 The opening of the Sugar Maple Trail addition was held on Mother's Day on May 10. It was great success and fun was had by all who attended. There were over 50 at the ribbon opening and over 75 were served breakfast at the sugar shack. 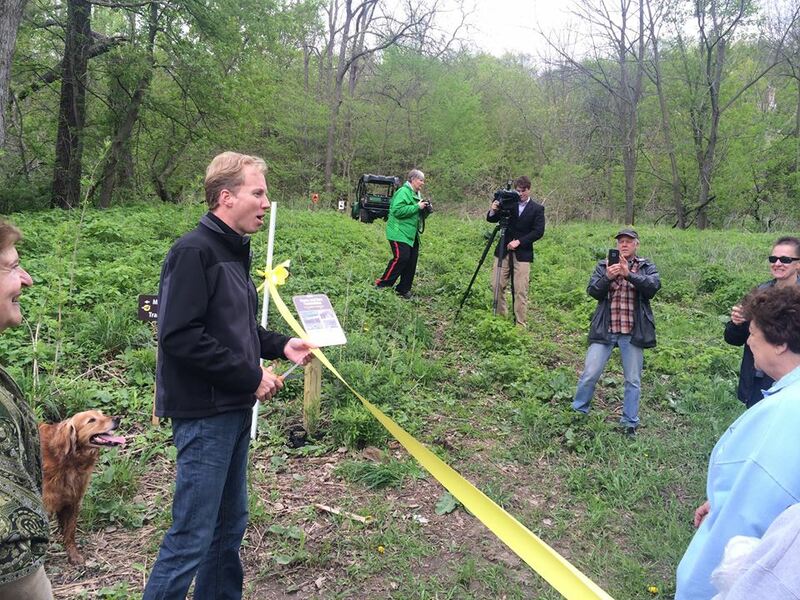 Thank you to Tom Overlie, from KTTC News, for cutting our ribbon. Grand Opening Press Release in 2013: Thurman Tucker will cut a ceremonial ribbon on June 16, 2013 to mark the official opening of the Norwegian Ridge Birding and Nature Trails at Spring Grove, MN. All are invited to this rural environment away from the hustle and bustle of urban life!!! This exciting opportunity will be of interest to birders, naturalists and eco-tourists. The trail is part of a public trail system that includes Trollskogen and Roverud Parks both within the city boundaries, and it is designed to showcase birds and spectacular scenery for local residents and visitors. The trailhead is just on the south side of Red’s Hometown Market that is located along State Highway 44 on the east edge of Spring Grove. It is marked by a hand-carved sign made by Larry Wolfs, a member of the task force. Funding for the trail is made possible through a grant given by the Southern Minnesota Initiative Foundation of Owatonna, and from gifts by private donors. For the past several months a task force of volunteers has met often to create and develop a two-mile trail called Gå På Tur, the third link in the trail system, which has a one-mile option for those who might be short of time. There are 56 signs that identify birds one might see while on the trail. Each sign shows the male and female, tells approximate size, and gives the scientific name, the common name, and the Norwegian translation of the name. In addition the signs list nesting habits, eating preferences, and whether or not the bird migrates. Each sign shows a QR Code for smart phone users to access the bird’s song as well as additional information. The people on the task force have a keen interest in the education of all ages to the benefits of songbirds and of preserving habitats for many species. 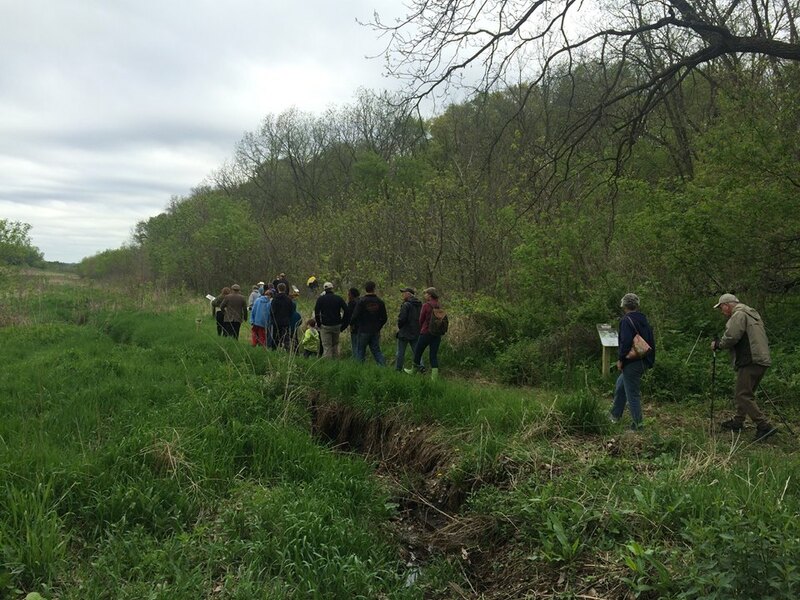 Located in the bluff country of this driftless region, the trail is mowed and crosses meadows and deciduous woods going past ponds and small streams where water trickles over rocks on its way to larger streams as it traverses private lands. Some birds love that type of habitat while others prefer woods or open meadows. There are three geo-cached sites along the trail as well. Families and their friends are encouraged to honor Dad by going out in nature and learning about birds while getting some beneficial exercise. We encourage you to linger along the trail with binoculars in hand. There are benches along the way where one can sit and enjoy the sounds of birds above and rushing waters behind your bench. Early in the Spring there are a variety of wildflowers blooming. During Spring and Fall many species migrate through this area, including scarlet tanagers, osprey, and Eurasian ring-necked doves, plus an exciting myriad of warblers. During the quiet time of evening there is a lot of owl activity year around. The task force has decided to create four Northern Bobwhite Quail Habitat Restoration spaces close to the trail. The advisor for this part of the endeavor is Thurman Tucker, Minnesota Quail Forever’s State Coordinator who received the Volunteer of the Year Award on February 16, 2013, a well-deserved award after volunteering for more than 40 years throughout Minnesota to re-establish Bobwhite quail populations. Walkers may wish to pick up a trail map with lists of birds to check off as they see them. Water bottles, hand-carved walking sticks and T-shirts are available for sale at Giants of the Earth Heritage Center, 165 West Main Street in Spring Grove. Check out the Scandinavian Gifts available in the store as well. At approximately the half-way point of the two mile trail, a picnic table is provided for anyone who wishes to bring a lunch. Birds, white tailed deer, wild flowers, mink, fox, and grouse – we’ve got it all and it is waiting for you to come to Norwegian Ridge and experience it whether you’re a novice bird enthusiast or a seasoned listener. The trail is open year-round, a sweet place to snowshoe, and there is no admission charge. It is a great place to exercise dogs, and if there aren’t other dogs present when one is on the trail, it’s okay to let your pet go off-leash for some extra exercise. Photography opportunities abound. We invite folks to bring their cameras and take shots of birds or to preserve a memory and share it with friends on Facebook, and on the trail’s Facebook page.